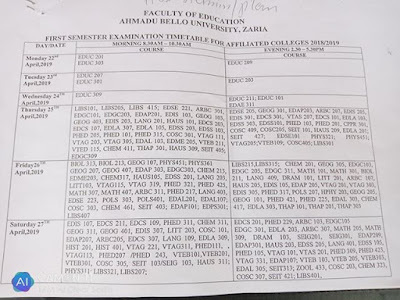 The Management of the College of Education Zing, COEZING in affiliation with the Ahmadu Bello University, ABU Zaria has released the examination timetable for first semester, 2018/2019 academic session. According to the timetable COEZING first semester examination will commence on 22nd April, 2019. The Time-Table has been made public at all the faculties notice boards. All students are expected to complete their payment of fees and registration on or before the examination date.